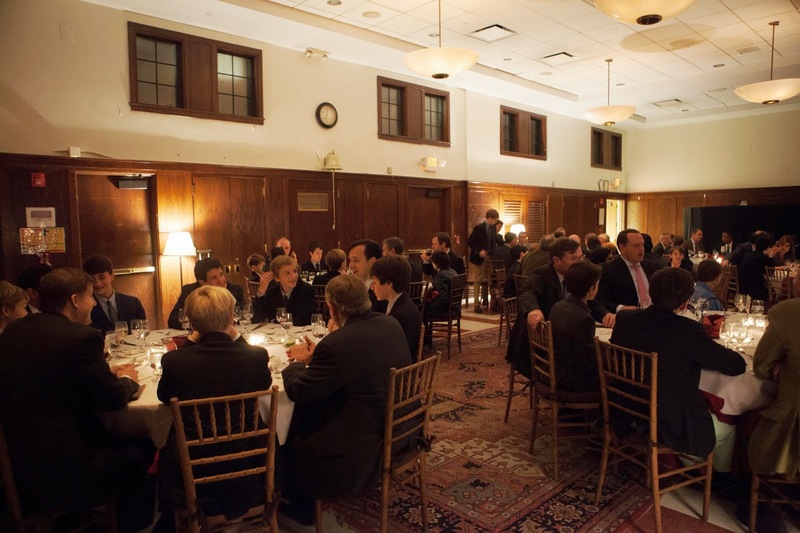 Yesterday evening was one of my favorite school events, our annual Young Alumni Chapel and Dinner. 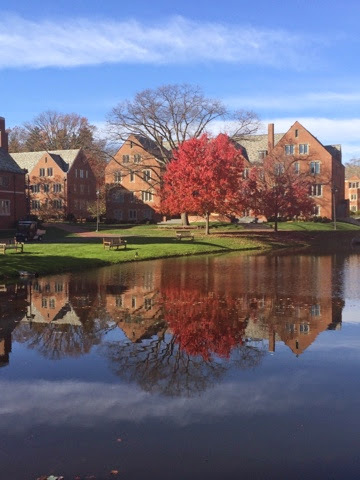 For this pre-Thanksgiving event, our high school age alumni join our current eighth graders for a Chapel talk, given by a young alum, and then gather for dinner in Hyman Hall. 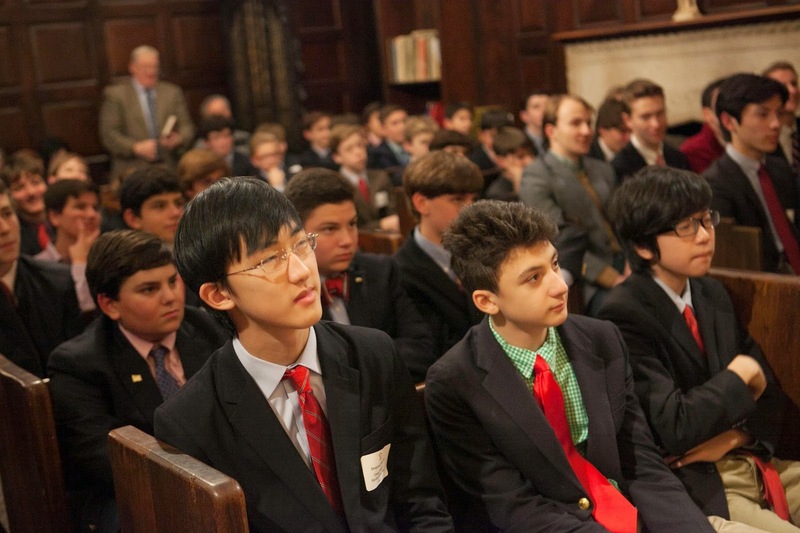 This year the Chapel was packed with boys and faculty, more than 200 present. 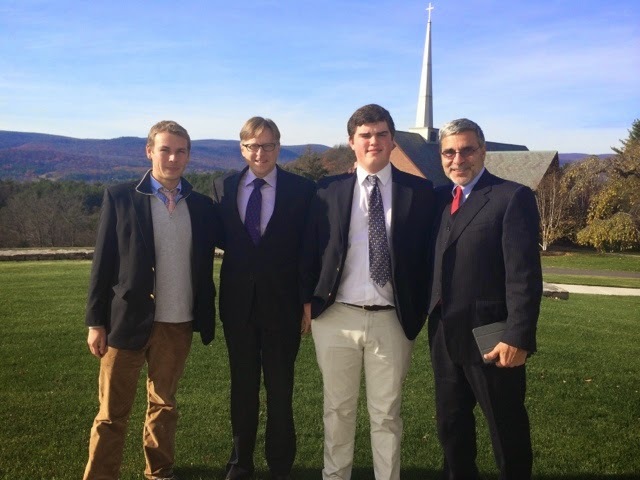 Ben Singleton '05, a graduate of Regis and Yale, gave the Chapel talk. He addressed the boys about how he decided upon a career in law enforcement, which began shortly after college in the District Attorney's Office and has led him to the NYPD, where he soon will enter the Police Academy. 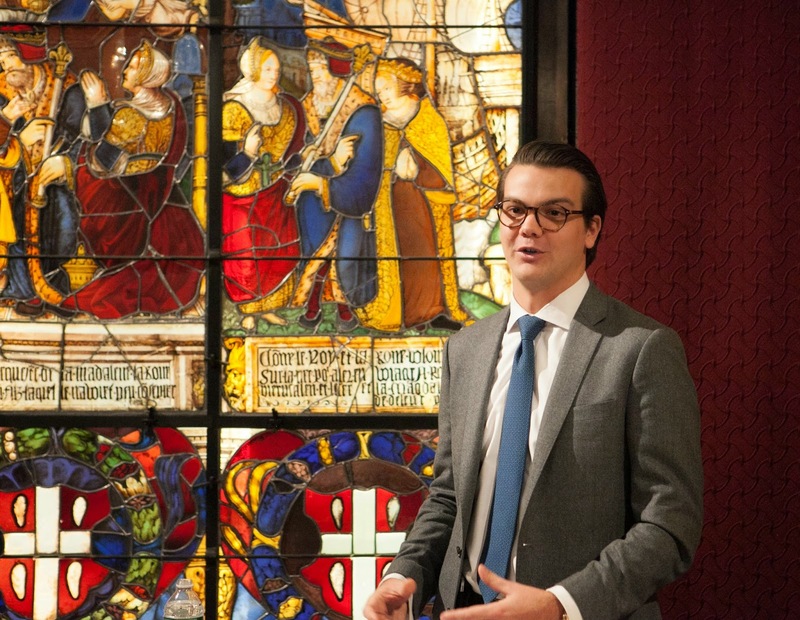 Ben described how he came about finding his passion not through a sudden bolt of inspiration, but rather through much reflection, and by exploring what he was curious about in school. "The police department was not where I would have expected to be," he said, "but I realize it was inevitable." His message to our boys: "Give yourself time to reflect, to develop your interests, and passions." 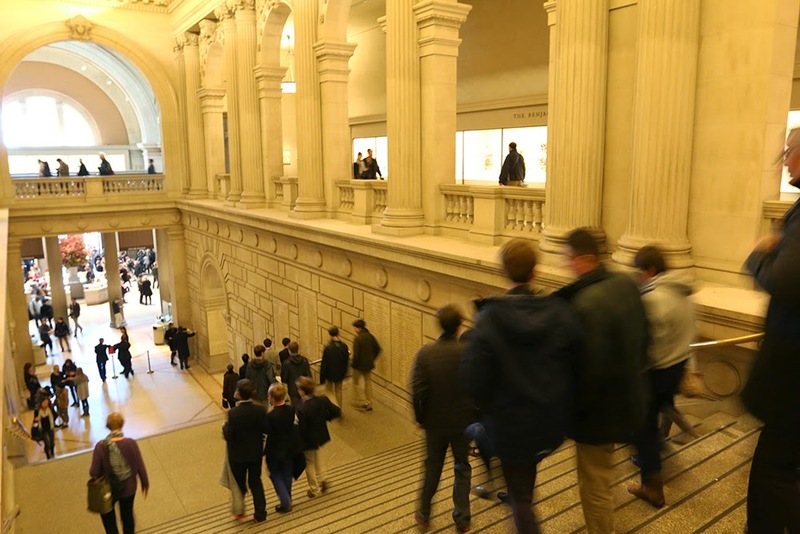 He noted the creativity of the curriculum at Saint David's when he was a student here in projects such as ARCO, which are open-ended, and how those types of academic experiences are helpful in determining your life's work. 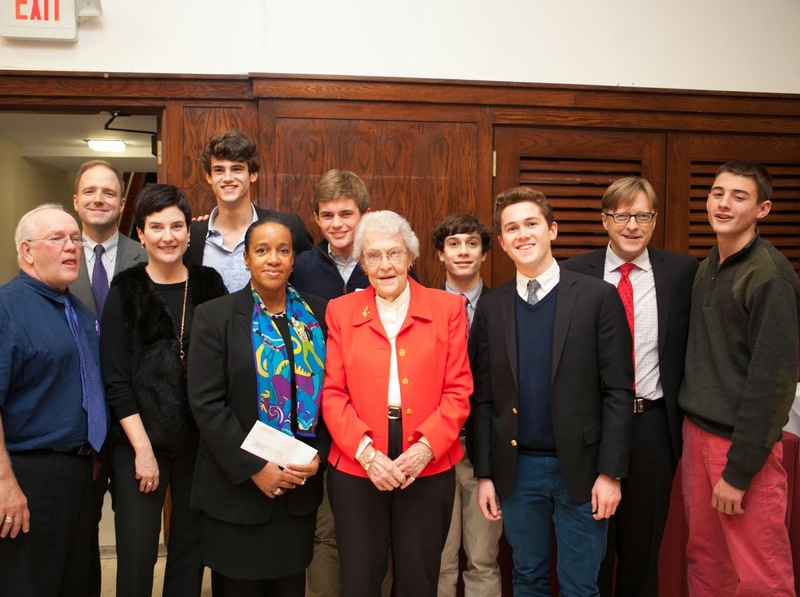 After presentation of the check to Save the Children reps.
During the dinner, Frank R. '14, last year's Student Council President, presented a check to Cheryl Anderson of Save the Children for our continued support of the Saint David's Kalina School in Ethiopia, which opened in June, built through funds raised by our boys. 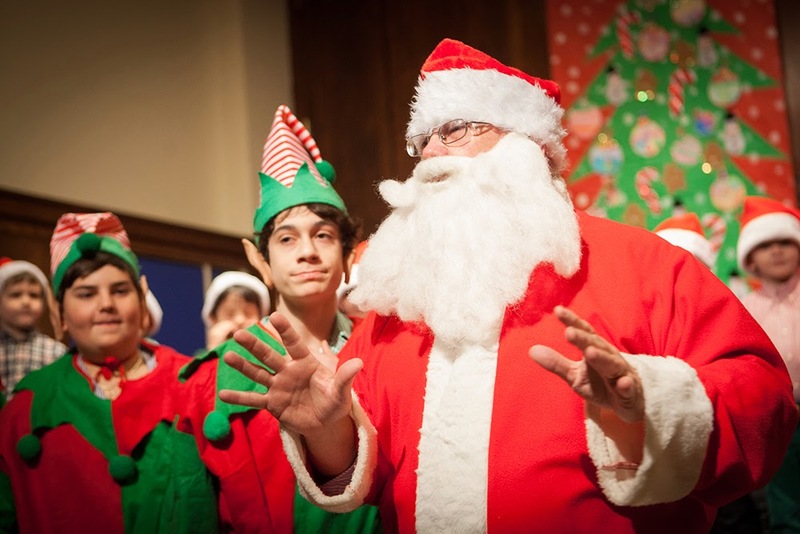 Frank and his class's student council had led the entire student body in a fundraising effort all last year, the fourth class to do so in support of the Kalina School. In fact, all four of the Student Council Presidents whose classes raised funds for the school were present last night as was Mimi O'Hagan, whose organization, Mimi's Building Blocks, was our partner in the project. As we watched a short video on the Kalina School, I was so proud of all of these boys, whose efforts on several fundraiser projects have made the Kalina School a reality. Thanksgiving is a special time at Saint David's: our school-wide Thanksgiving Food Drive, our oldest community action project, is always a huge success, providing full meals to our neighbors in need. The boys have worked hard throughout November, selling pies, collecting cans, and boxing the meals. As a community, we have much at Saint David's to be grateful for; through our work for the greater good both in Ethiopia and in our backyard, we give back. Thanksgiving must be close... Today was Saint David's annual Turkey Run, which takes our second graders to Riverside Park for a 450-meter run. They have been training for this run every day throughout the fall in their athletics classes, and they sure were ready. Parents and siblings came out to cheer on our young runners. This was the 17th running of the Turkey Run at Riverside Park and the 42nd Turkey Run since its inauguration. 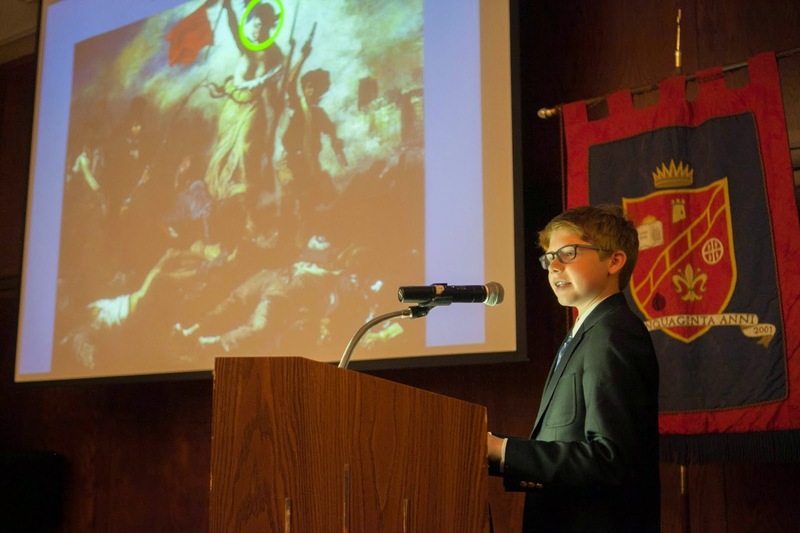 Originally, it was run by the 8th grade who circumnavigated the Central Park Reservoir at great speed. The winner received a frozen turkey that he then ceremoniously donated to the Annual Thanksgiving food drive. It was in the 1970s that the responsibility of the tradition shifted to the 2nd Grade, where it continues to reside to this day. 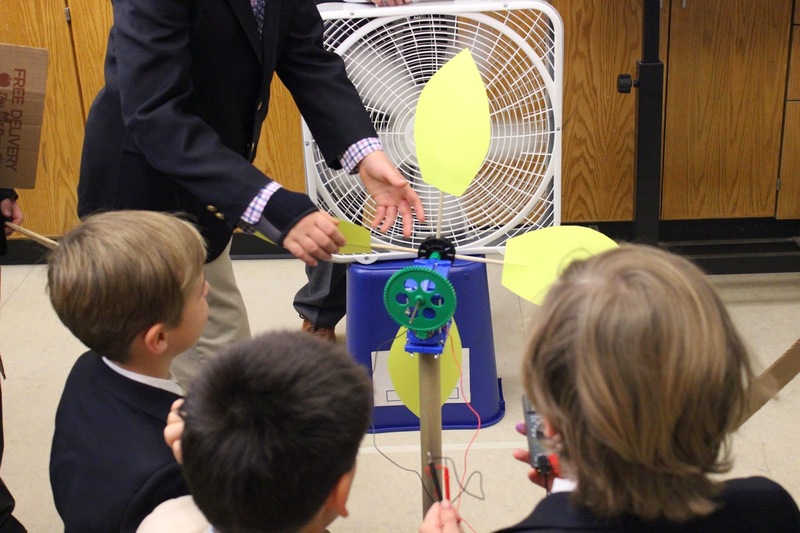 Boys in fifth grade are building wind turbines in a series of STEAM classes. In a session earlier this week, they drew diagrams of wind turbines, identifying the key components needed in order to generate electricity. This was followed by a discussion on kinetic energy, gears, and what is needed to move electrons at sufficient speed in a circuit. 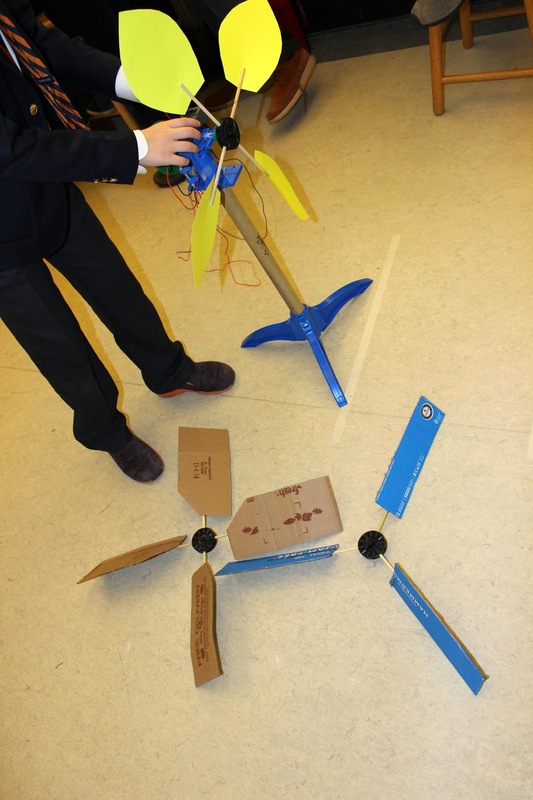 For the remainder of the class period, they experimented in small groups, with various size gear combinations as a first step to building their own turbines. This involved some problem solving: For one of the rotors, the blades were too large and created friction, slowing down the spinning. To address this, one boy suggested moving the rod forward to increase space for the blades to spin in. Next, they will move from observation to experimentation as they work in teams, picking one of the five variables to change and test, while controlling for the other variables. They will report back on their team’s findings and the class will use the data to then build the best rotor for their wind turbines. 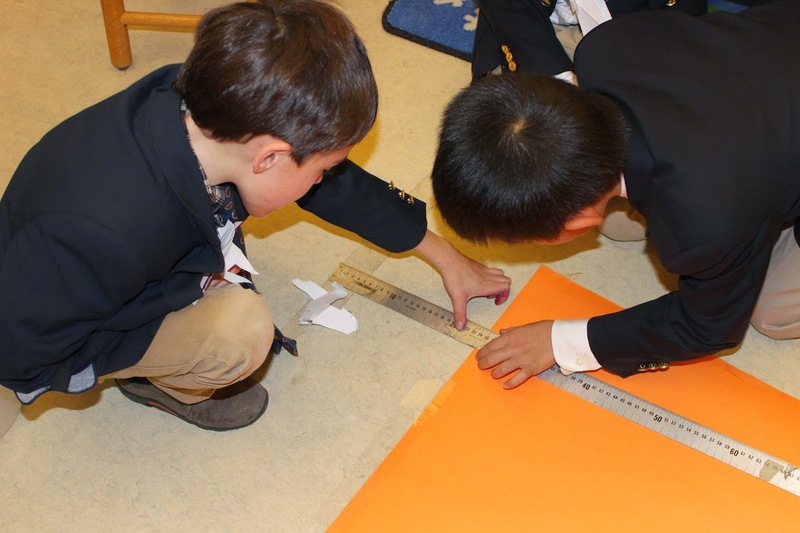 "Trying things out" via trial and error, and using the results of the scientific process to create something tangible and useful, is a focus of our STEAM program which stresses problem solving skills. Fifteen faculty and staff members gathered in our 6th floor art studios last Friday afternoon for a “Make Your Own Mug Pottery Party.” Pottery teachers Mark Sunderwirth and Melanie Fidler taught the mostly neophyte potters to hand build a mug or other vessel with coil and pinch pot techniques, encouraging participants to add creative and personal elements to their work. One teacher made a pot in the shape of a blueberry muffin as a holiday gift for her husband, and another made a free-form coil pot which was inspired by undersea life. “It was truly a fun, creative, and relaxing way to end the week and spend time with colleagues,” said one modern language teacher, “and clay is such a soothing medium to work with!” A follow up glazing session will be held the first week in December so that the artists can add color and complete their creations. True community is an ideal of our school, and the pottery party is a great example of the many ways that our faculty and staff come together, during their free time, to share their talents and knowledge, and to enjoy each others' company. 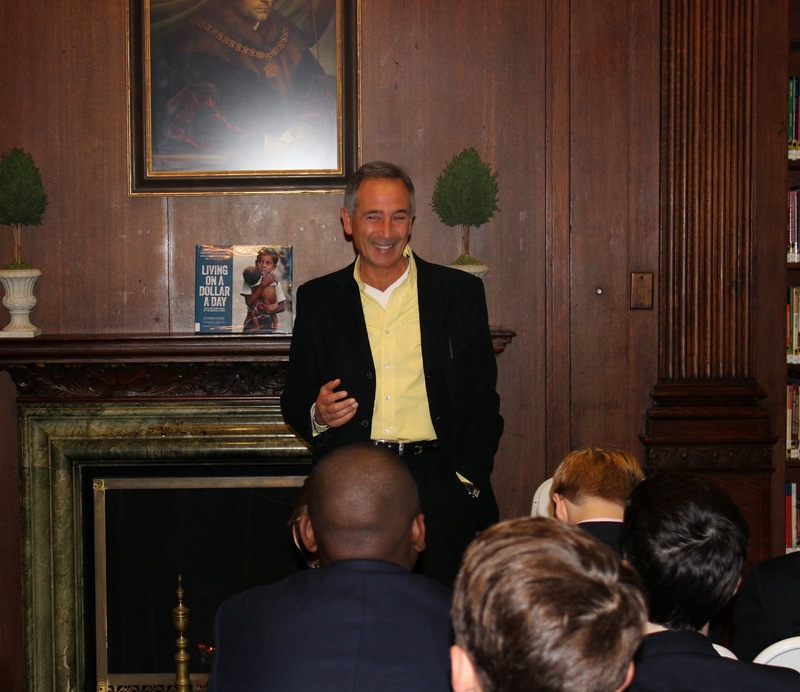 After being introduced by two of our seventh grade student council members, Mr. Nazario began by telling the boys about a seminal moment during his youth in Spanish Harlem; how at 4 1/2 years of age he saw a mother and child going through the garbage for dinner on Thanksgiving Day, and how that experience left an imprint on him. 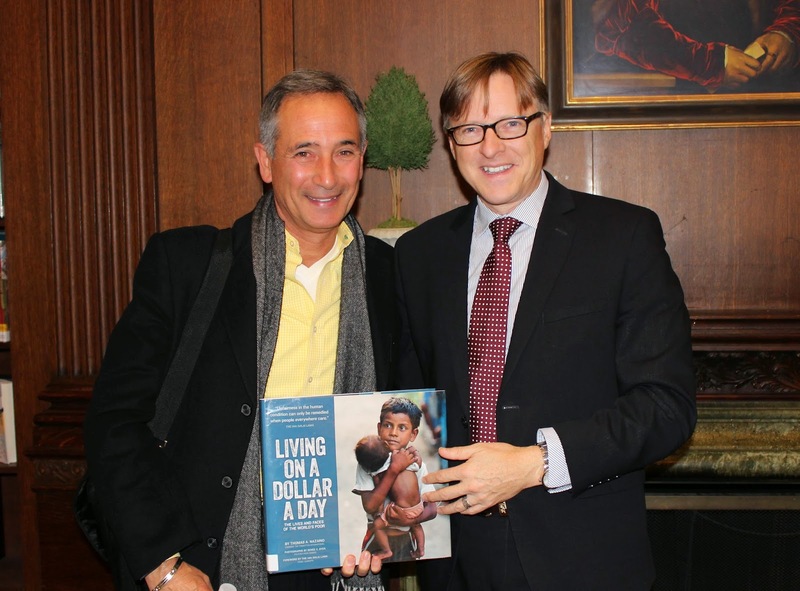 He told the boys “If you love writing and have something to offer the world, you should do it.” His new book addresses his work’s passion: in more than 200 photos and text, it tells stories of the world’s poor, the one-sixth of the world’s population that lives on a dollar a day or less. 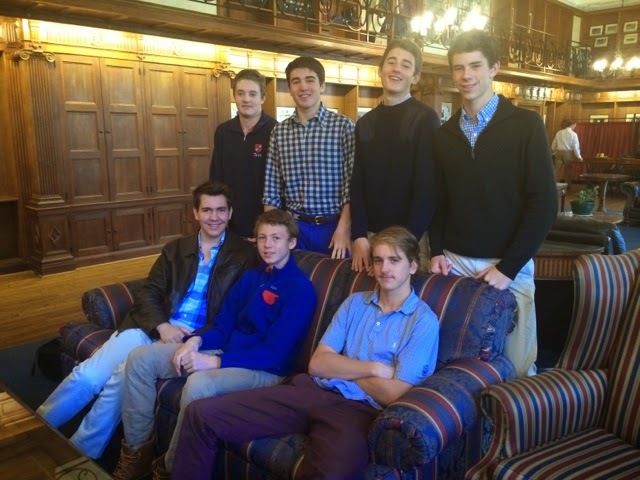 In preparation for the talk, the boys submitted to Mr. Nazario essays about the things for which they are grateful. Impressed with the boys’ thoughtful writings, he commented that the most common responses were gratitude for family, friends, school, and health. He commended the boys for expressing the realization that they are fortunate and blessed to have so much good in their lives. A discussion about extreme poverty, and the social, economic, and political factors that contribute to issues like lack of access to education and basic health care ensued. 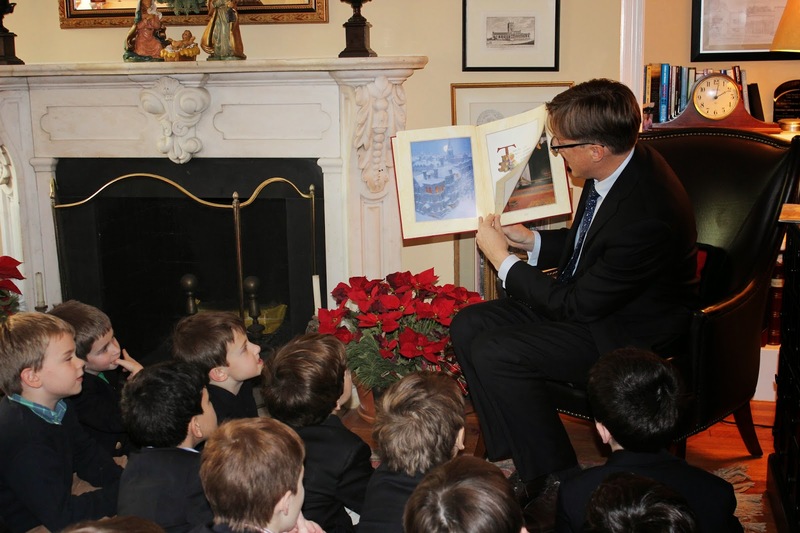 This led to reflection on our school’s ultimate aspiration for our boys to “be good men.” At Saint David’s this is made real by doing good, and by having our boys reach out to help communities both near and far, in ways both big and small. For the seventh and eighth grade boys, the discussion around qualities of a good man were particularly significant, as the seventh grade will explore examples of Agents for the Good this year, and the eighth grade will examine how thinkers of the Renaissance can inform our definition of what it means to be a good man today. It was a moving and inspirational morning. I am certain our boys left the Hume Library with much to ponder. 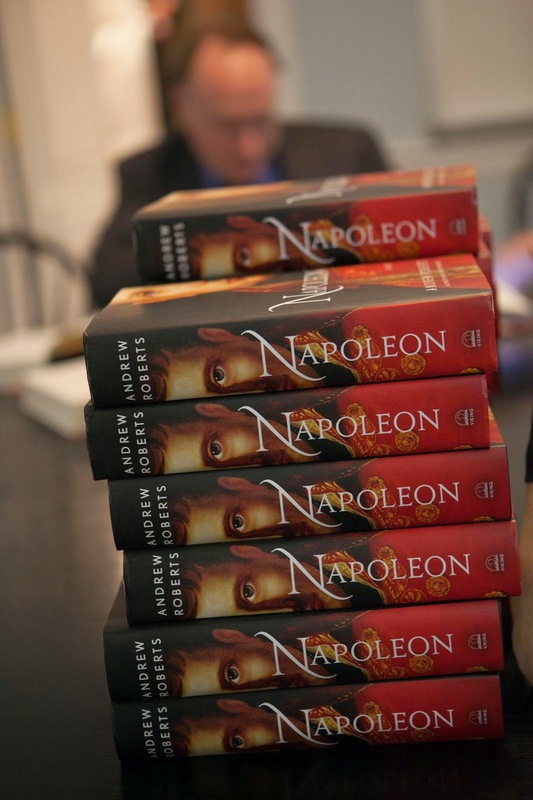 This morning’s talk was made possible through our Parents Association Author Series, which annually brings noted authors to the school to talk to and inspire our boys. 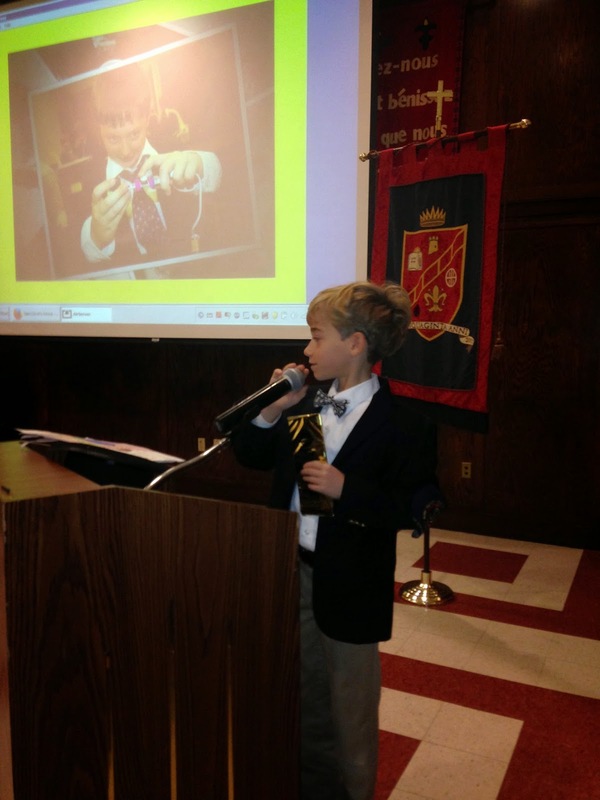 Two 7th Grade boys, George and Aidan, helped present a special project at last week's ParentsAssociation meeting. 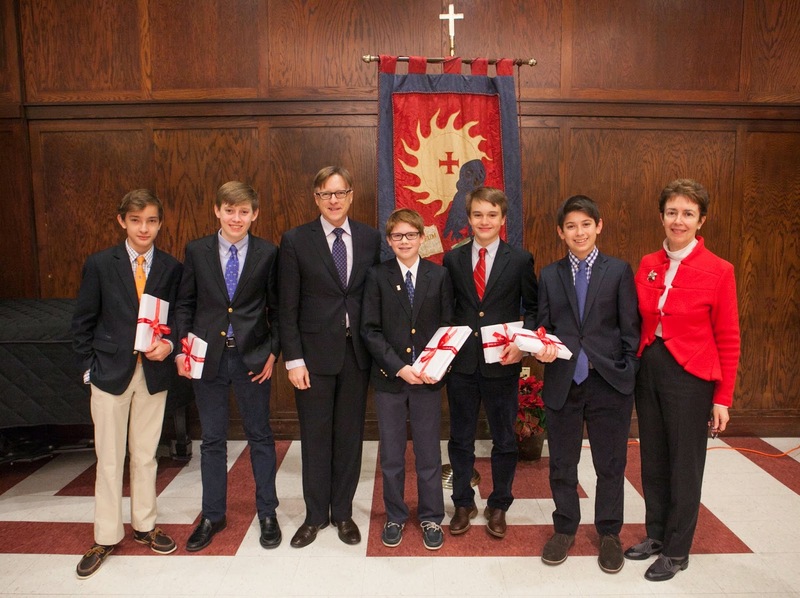 Both boys are presently members of 7 Theta, but the project, which was developed and taught by Brendan Hannon, was part of their 6th grade math class last spring. 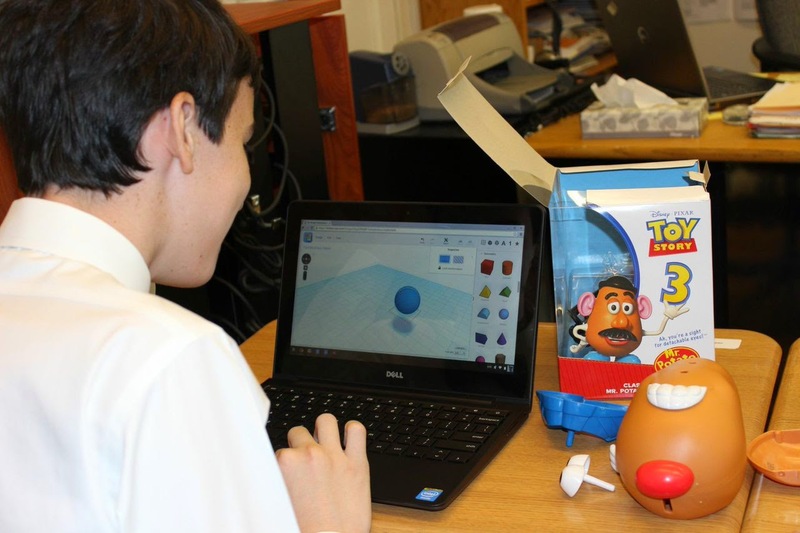 It was the culminating project of a geometry unit on calculating the volume and surface area of solids and a great example of innovative, integrated curriculum at Saint David's. Mr. Hannon, 6th Grade math teacher, challenged his students to design a city block that had a minimum volume of 150 square cm. The block must have a 10x10 cm “footprint” and have at least four buildings. Buildings could be designed using any of the solids the boys had learned about in class. Boys then had to explain which solids they used, and show the calculations for each of their buildings. The procedure employed by Mr. Hannon had each of the boys create an account on tinkercad.com. Once created, they processed through several of the tutorials to learn the basic functionalities of the software. Boys then spent approximately four classes designing, building, and then 3D printing their city blocks and calculating their volume. Boys who met these requirements were then challenged to calculate how much glass it would take to cover their buildings, introducing surface area. In the fall of last year, as part of a series of hands-on technology workshops during Friday faculty curriculum time, Tech Integrator, Nora Sundar, lead a workshop on 3D design and printing for math, science, and art teachers. 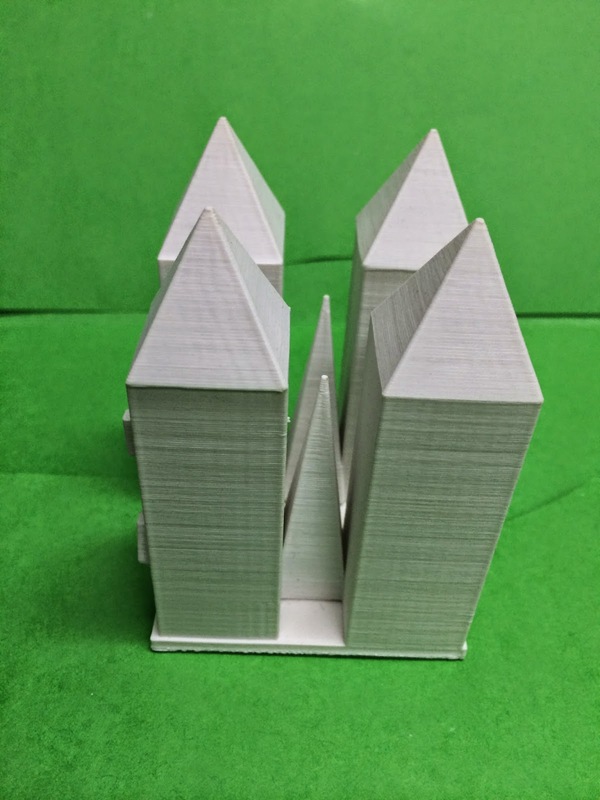 Brendan Hannon was intrigued by the process and the possibilities, and began working on designing 3D printing projects on his own, to explore the technology and build his own skills. 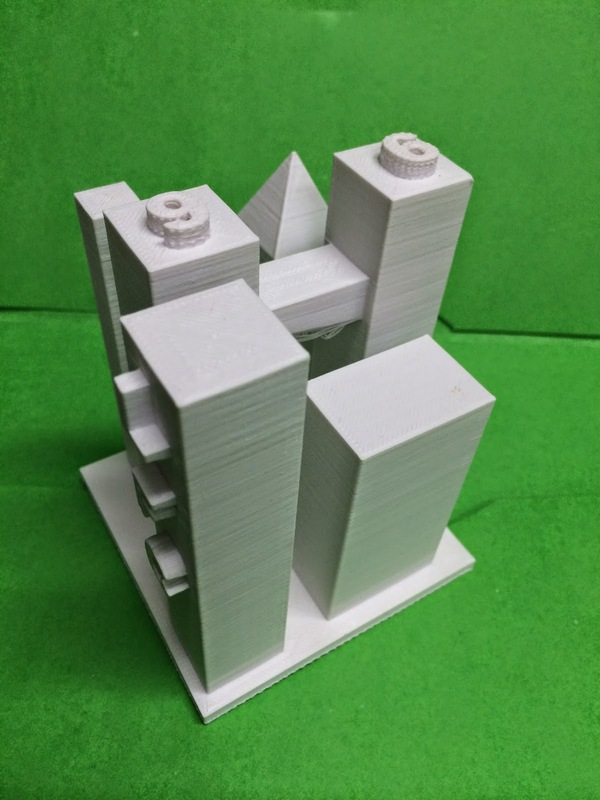 By the spring term, when Brendon was teaching a unit on calculating volume and surface area of solids in 6th grade, he was excited to share his enthusiasm for 3D design and printing with his students in a way that he knew would motivate them and (quite literally) give their work a new dimension. 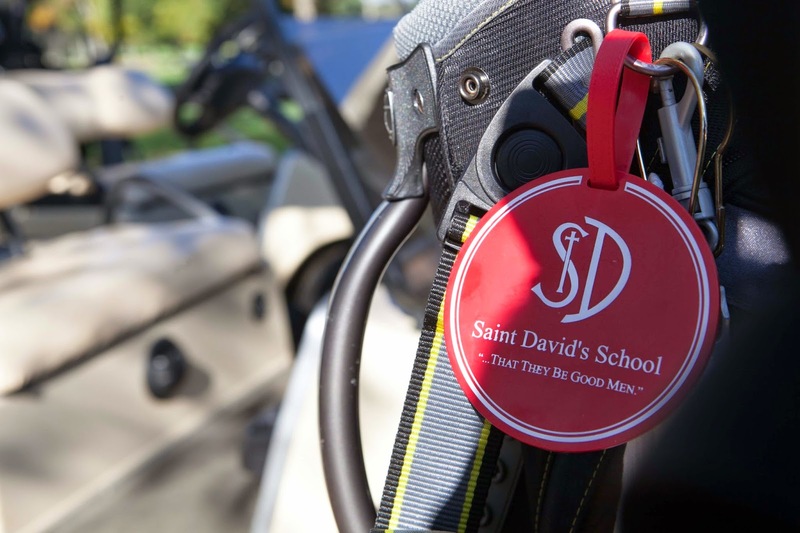 At Saint David's, technology is thoughtfully integrated. The way we choose to integrate technology makes learning more active, and our teachers are the ones leading the way. Throughout the fall, our third graders have been studying late 19th and early 20th century immigration to this country and its impact on their city, state, and nation. This is an active unit involving extensive learning beyond the classroom, close examination of primary sources, and cultivation of creativity. 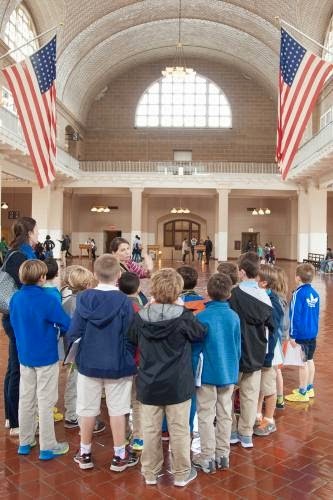 It began in October when, after studying immigration history, trends and reasons in class, the boys visited Ellis Island where they explored primary sources and artifacts. Then just last week, the boys engaged in a Mock Ellis Island activity in which they assumed the identities of immigrants going through all the steps of immigration processing, from being interviewed by health, education, and character inspectors, to experiencing the thrill of being "admitted," to the disappointment of being "quarantined" or "deported." 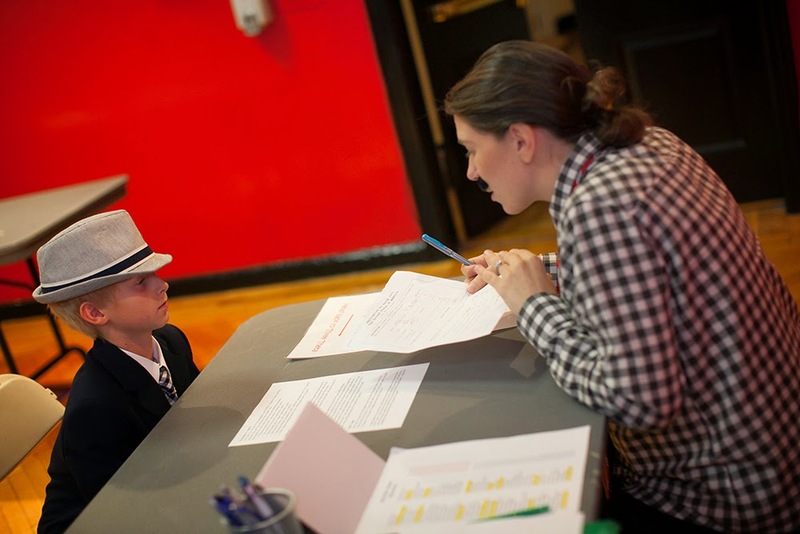 Immigrant undergoing processing during Mock Ellis Island. Next week, the boys will visit the Tenement Museum on the Lower East Side and experience the way immigrants lived in New York after arrival. 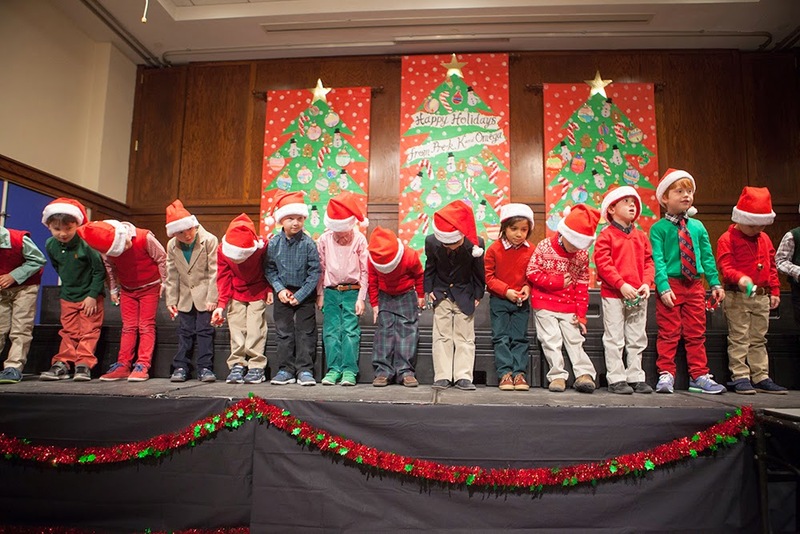 Through all of these activities, our boys develop an appreciation for the immigrant experience and begin to examine the many aspects of how we define culture and the contribution of immigrants to it. The boys will then use this foundation during the winter term, as they study the cultures of Haiti and South Korea, and engage in a related research project. Admitted immigrants take oath of loyalty. This is a rich unit of study for boys of this age. The ideas and ideals that drove, and still drive, immigration to this country are important for all citizens to consider, explore, and reflect upon. 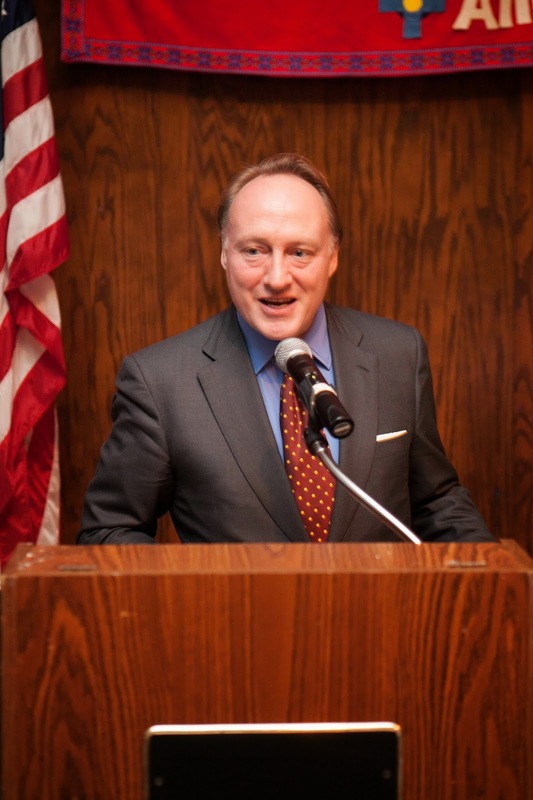 It is equally vital that our boys, as citizens of the world, begin to understand and appreciate the various, and at times complex, similarities and differences among cultures, countries and societies around the topic of immigration. 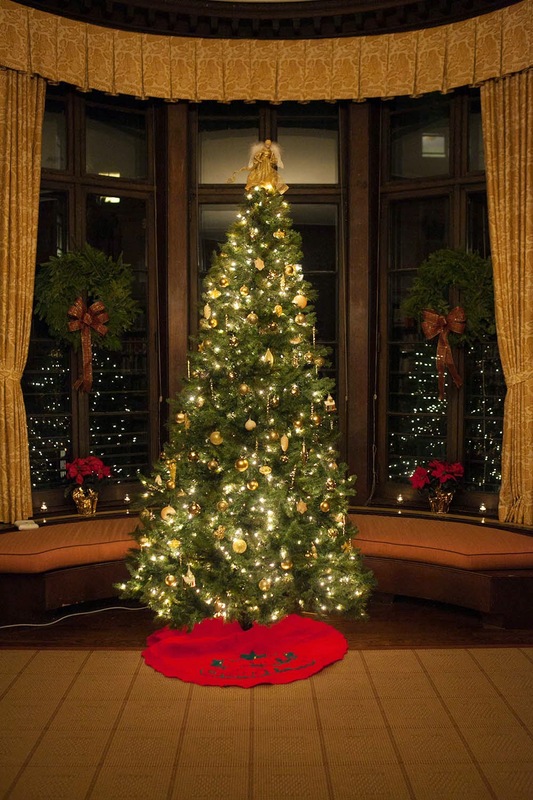 I started my day early today in Hyman Hall listening to beautiful music. In keeping with tradition, our Philharmonic Ensemble held an open rehearsal this morning in the form of a 'Coffee Concert'. 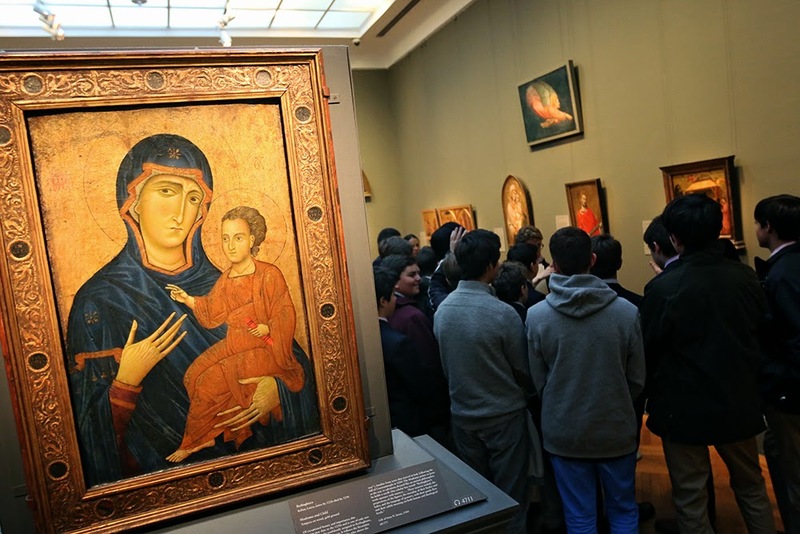 Parents were invited to a "behind the scenes" experience to capture a glimpse of their son's work and learning as a member of this most special of "teams." 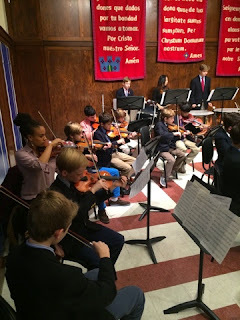 I am always struck by the incredible difficulty of the pieces our boys perform--especially when I think about their ages, 9 to 14--and the relative ease and confidence with which they play them. 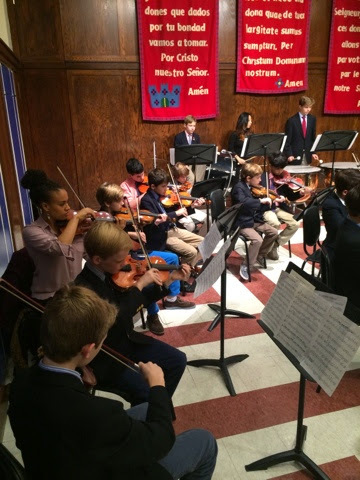 This morning's program included: Haydn's "St. Anthony Chorale," Mozart's Overture to "Lucio Silla," and the "Dance of the Tumblers" from Rimsky-Korsakoff's "Snow Maiden". Last week I had the great pleasure of spending time at Loyola with alums: Henry, '11, Nicholas '11, Tomaso '11, Luke '11, Henry '11, John '12, Peter '12, Jack '12, Jaime '12, Filipo '13, William '14, Michael '14, and Colin '14. Joined by Mr. Imbelli, we sat for lunch in the conference room surrounded by impressive framed art pieces created by seniors. Five Saint David's alums are graduating from Loyola this year. 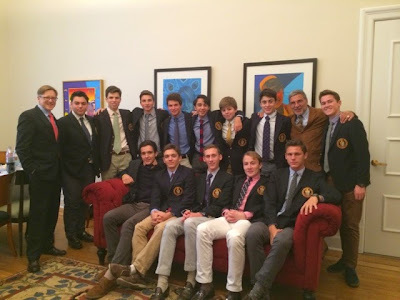 All the boys clearly enjoy their school and felt well prepared by Saint David's for high school. The boys also offered several suggestions for strengthening our program as well as several aspects of their experience at Saint David's they would never want to see change. It was an enjoyable, productive visit. 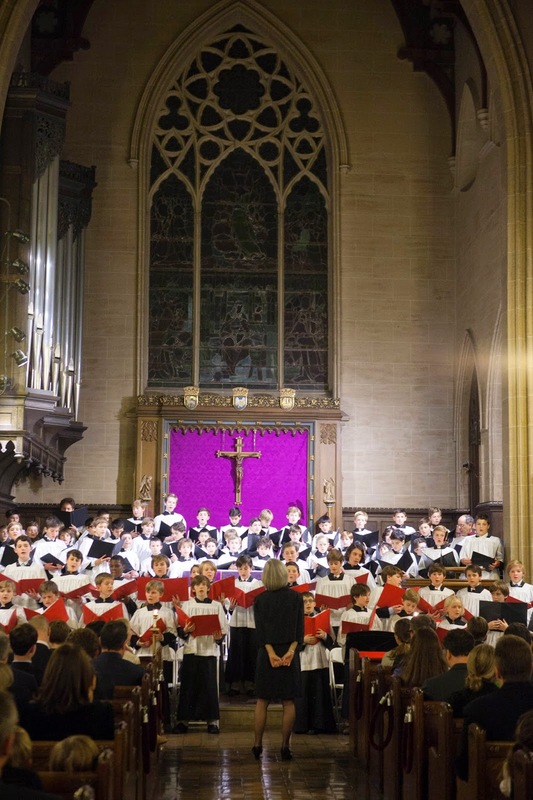 Seeing Saint David's boys thrive just never gets old. At Taft visiting Alexander '11, Freddy '12, Henry '12, Graham '13, Conrad '13, John '13, Zach '14, Ben '14, and Frank '14 in the Faculty Room. Great opportunity to catch up. Boys are spirited and happy. At Salisbury with Billy '11 and Bennett '14. Beautiful Day. Boys thriving. 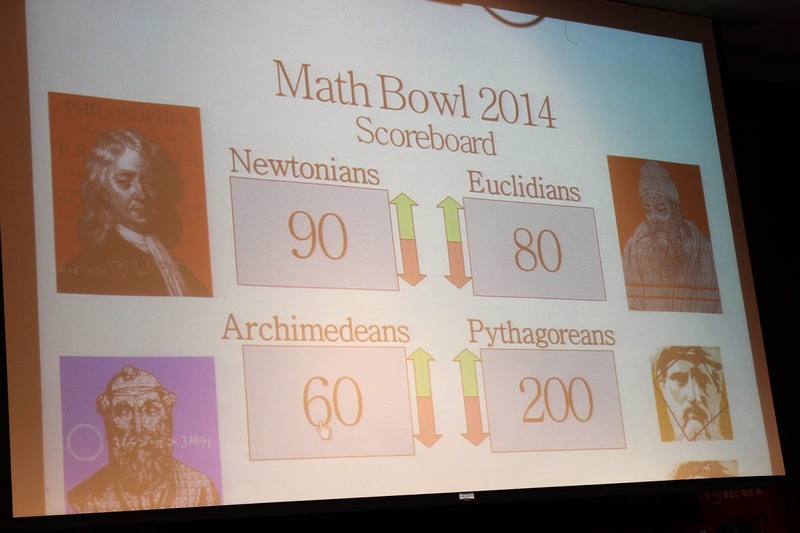 On Monday the Pythagoreans won the school's Math Bowl, achieving a final score of 200, with the other teams making strong showings. 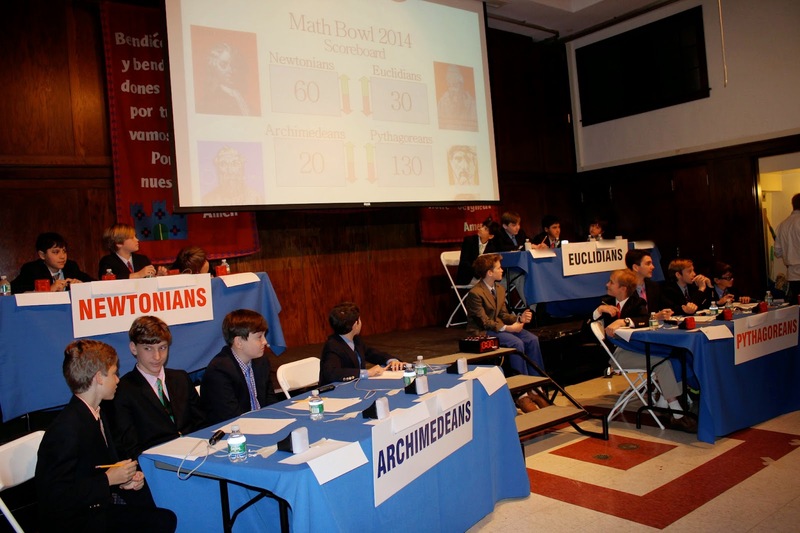 The Math Bowl is an annual math department contest in which four teams of our boys in Grades Five through Eight solve a series of math problems, created by their teachers. The problems present real-life scenarios and require the multi-step application of abstract mathematical concepts to tangible situations. It is impressive to witness how comfortable, quick, and accurate the boys are with the problems posed. 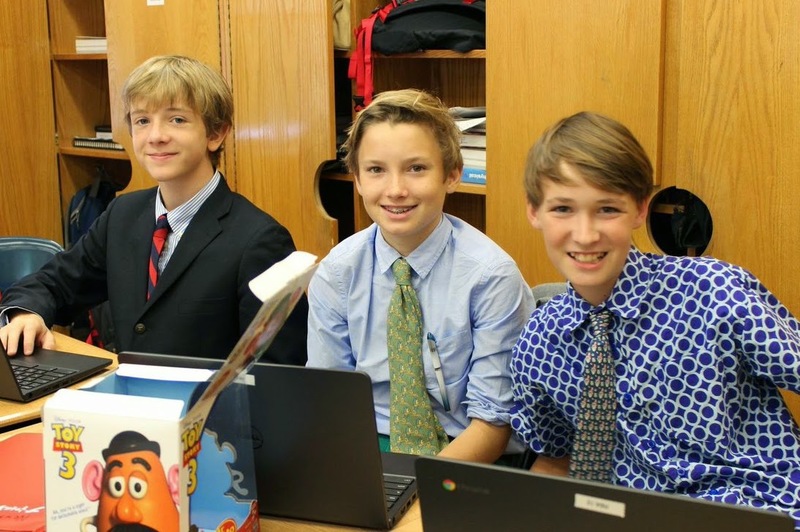 All the Upper School boys attended the contest, and the cheering in the room was indicative of the fun that can be had at school, even when solving math problems! 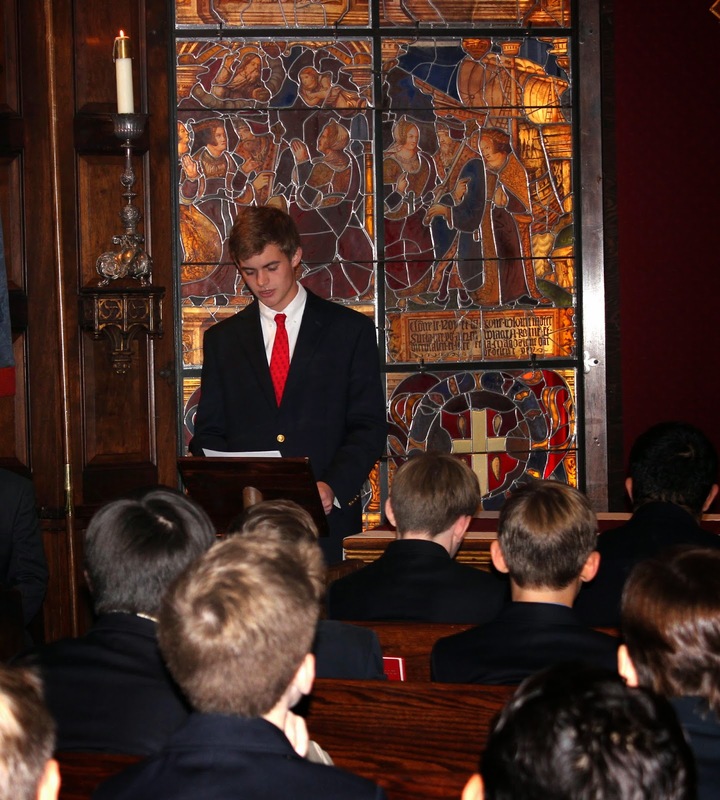 Alums Skakel McCooey ’13 and his father John McCooey ’72 gave a joint Chapel talk to our seventh and eighth grades on the school our boys recently built in Ethiopia. Both Skakel and John were members of the Saint David’s contingent that traveled with me to the Saint David’s Kalina School this past June for its official opening ceremonies. Skakel, who was one of the three Student Council Presidents who led the project, spoke about how the combined efforts of all of the boys of Saint David’s and their teachers, in particular Tom Ryan, over three years of fundraising, had resulted in the successful construction of the school. At this morning’s Parents Association Meeting, Saint David’s Director of Curriculum Integration, Nora Sundar, talked to our parents about the school’s exciting integrative STEAM program. Third graders then took to the podium to discuss a new tech-integrated design unit that their class has recently completed. 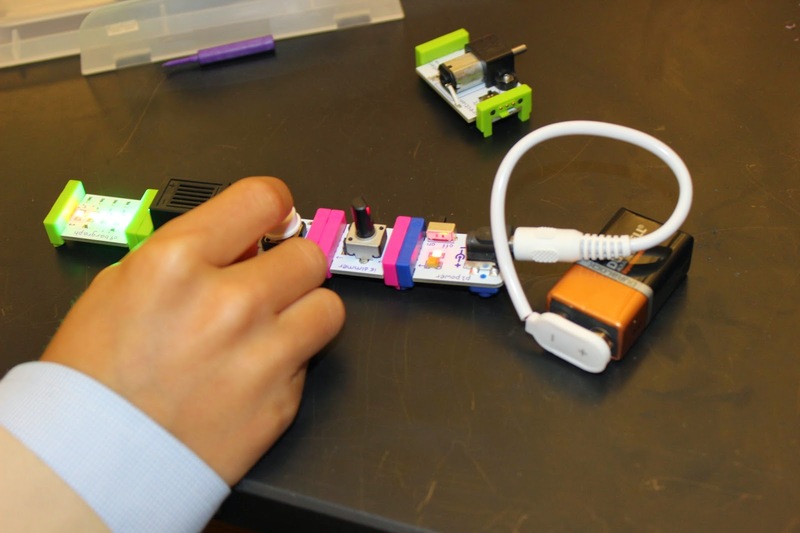 During the unit, the boys used littleBits, colorful electronic pieces with magnets that snap together to make circuits, powered by a battery. The boys noted how they learned, through trial and error with the pieces, the importance of proper sequencing to obtain a desired result. Once they had mastered how the pieces worked, the boys were then well positioned to put their new knowledge to use by building a burglar alarm for the Lower School science lab. The boys were clearly enthused about what they had learned and how they were able to build something tangible. 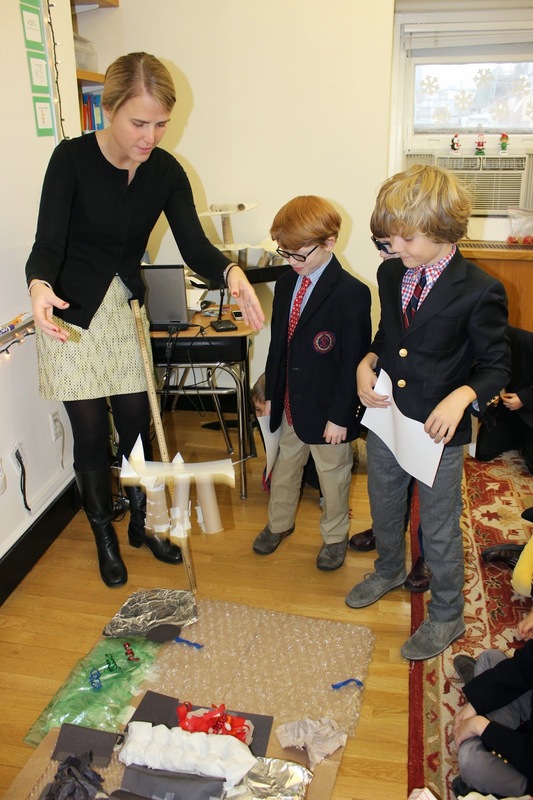 We have increased the number of science classes for our Lower School boys this year by merging and integrating our technology program with the science curriculum to allow the boys greater opportunities to engage in STEAM projects like the littleBits unit. 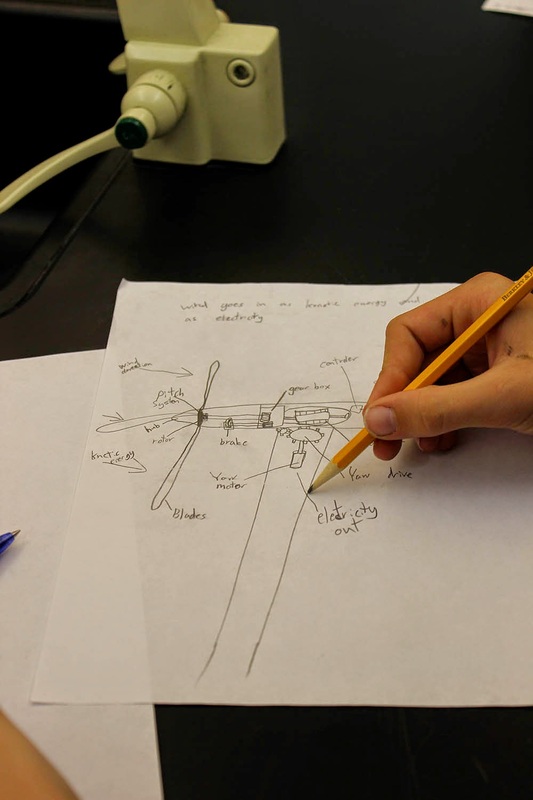 Our approach in STEAM is based on research suggesting boys need opportunities to work together to solve real problems in order to comprehend the connections among science, technology, engineering, aesthetics, and math. These types of projects, this type of learning, fits well into our school-wide theme this year of “Ideas and Ideals.” The boys are given opportunities to be leaders who understand the needs of various communities, and who are ready and willing to work together to solve problems. We look forward to seeing what else our boys will create and build! 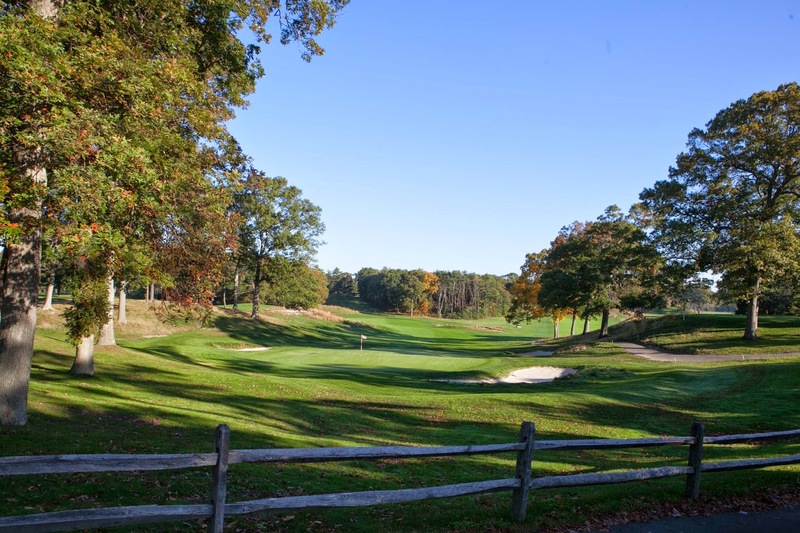 Fifty-four members of our Saint David's community played a round of golf on Bethpage State Park's Blue Course this past Saturday. 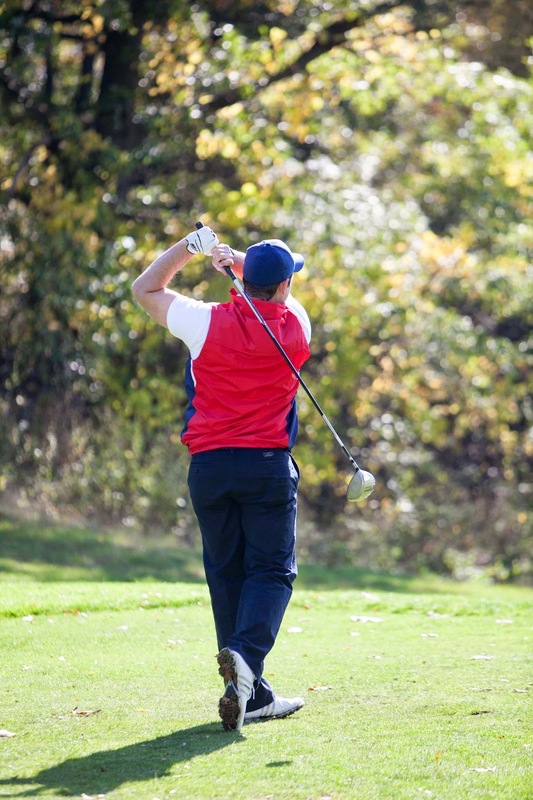 It was a spectacular day for the Saint David's Golf Outing, an annual tradition that guarantees not only a round of golf, but a great day filled with camaraderie and good natured competition. All walked away winners, either on the links or through raffle prizes. A terrific time was had by all!